The Everything Ghost Hunting Book: Tips, tools, and techniques for exploring the supernatural world (Everything (New Age)) ReviewI've read a number of "paranormal investigating" how-to books, but this is the one I'm most impressed with. First, it covers topics the other guides don't: a history of hauntings through the ages, following scientific protocols and team member accountability, and mapping power sources and natural anomalies (and that's just the beginning--I've learned more from this book than any of the others I've read). Second, each topic is covered in depth, and in many cases it takes the reader through a step-by-step how to. Third, it's well written and concise. This book is not only a wonderful primer for beginners, but a good resource to have for intermediates as well as those who are seasoned: everything is easily found using the index, so it's a great reference guide. In addition, those who aren't paranormal investigators (such as writers and journalists) who need to research the topic in order to sound knowledgeable about what they're writing will also find this invaluable. If you're looking for a well-researched book that covers every topic in paranormal investigating, get this one. You won't be disappointed. 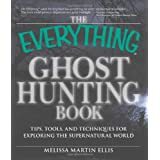 Want to learn more information about The Everything Ghost Hunting Book: Tips, tools, and techniques for exploring the supernatural world (Everything (New Age))?